Truth: nobody cares to be told what number of macaroons you just gobbled down. If you’re getting tired of reading trivial posts on your Facebook feed, get a load of this. 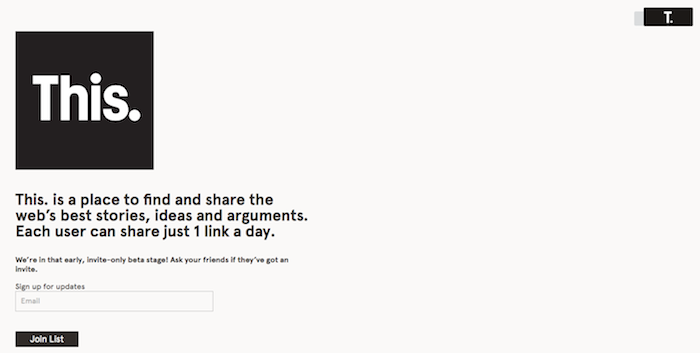 New social networking website This.com aims to put a stop to over-sharing of insignificant posts — by allowing users to post only one link per day. Metro reports that the network is currently at the beta-testing stage, and it “has a pretty active community”. Instead of posting pictures and GPS maps, This.com allows users to share links that people might actually want to read. Found a link you like? Click on a star to promote it. The project was started on June 2014 and launched by American magazine The Atlantic. As stated by the article on Capital, the name was inspired by a popular Twitter convention. Users would retweet a link and attest to it by writing the phrase “This” ahead of it. An Atlantic Media spokesperson has also revealed that the project has no set launch date. I have no problem with my Facebook friends sharing frivolous posts – after all, Facebook has the ‘unfollow’ button. Besides, how could I control what other people post when I wish for the same freedom and respect on mine? I get most of my reading material from apps like Bloglovin, so I doubt I’ll be using this ‘digital bookshelf’. Nonetheless, I’m curious to see how it takes off. People are constantly changing the way to stay current with news.